I’m really bad at keeping good news a secret. Like, really bad. Yeah yeah, home slice. 10-4. ….I spill the beans. Oops. But in the case of this Blogger’s Choice Recipe Swap, I just…messed up. I scheduled the post to go live at 7am (I normally post much earlier than that so to keep myself from posting early, I scheduled it to post at that time), but I forgot to change the date to today. So, I’m driving to work, stopped at a stop light, and see that Joanne had commented on THIS post…yesterday. Wha?! I pull over and quickly realize my mistake, 32 minutes after going live. Let me tell you, editing a blog post on a smart phone is officially on my list of “things I never want to do again”. If you saw this yesterday and I spoiled the surprise, I’m sorry. This recipe does bring good news that I wanted to share by the way of a killer California Roll recipe that requires no rolling of seaweed skills. Win-win. Despite my love for sushi and a challenge in the kitchen, I don’t think I’ll be taking up sushi rolling any time soon. Lettuce roll-ups, however, I can handle…that I can do. 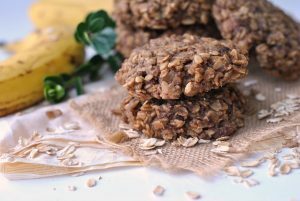 When assigned Lisa’s blog, Tastetastic Voyage, my ADHD kicked off and I actually paged through ALL of her recipes on one sitting…every last one (check her out!). I got it narrowed down to 7, most of which I will definitely be making, but ended up choosing this one. 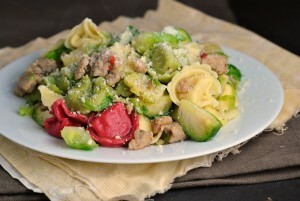 This was the perfect light, summertime meal that had lots of color going on. I definitely chose a winner. In a small sauce pan, bring 2 cups of water and a pinch of salt to a boil. Stir in rice, cover, and reduce heat. Simmer rice 20-40 minutes, according to package directions. Once cooked, stir in the vinegar and set aside. 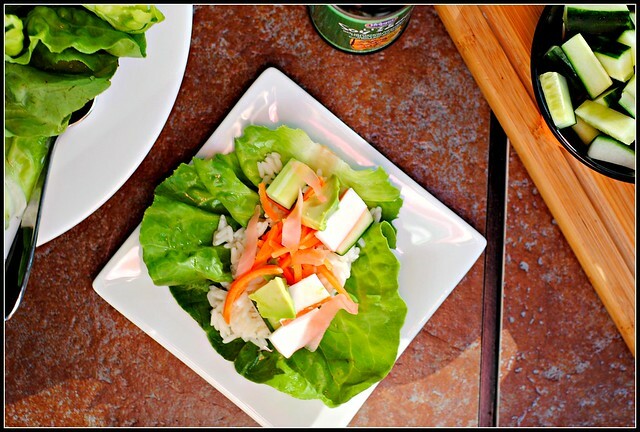 To assemble the roll-ups, layer several tablespoons of rice in each lettuce leaf. Layer on 2-3 pieces of cucumber, carrot, crab, and avocado. 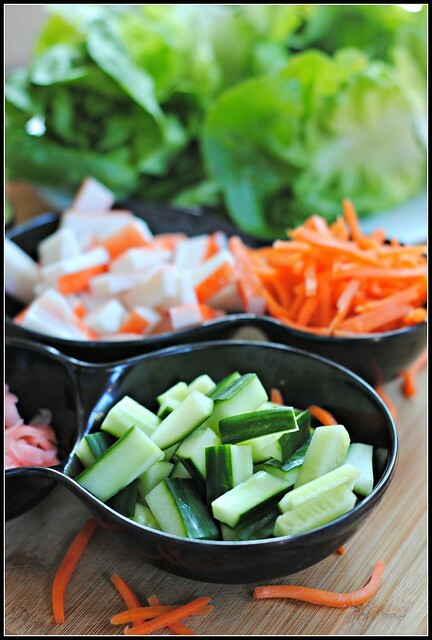 Top with pickled ginger and a dash of low-sodium soy sauce. Result: Perfect for summer! 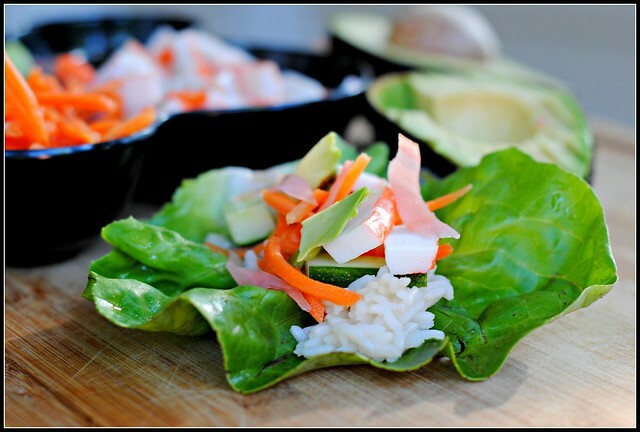 Everything you love about a California Roll in a lettuce cup vehicle. These are quick to assemble and are great as a light entree, or even as an appetizer or part of a cocktail party. They definitely present well and look fantastic. These are inexpensive to make (imitation crab is super cheap) and come together very quick. You’ll be shocked at how flavorful the rice is! Enjoy! TGIF! The in-laws are in for the weekend!! 🙂 No idea what’s on the agenda but after this crazy week, I’ll be enjoying every last second! WIN! All the deliciousness of california rolls without all the work of having to really put them together. And so healthy too! Hey lady! Glad you liked them so much that you just had to share them early! Your blog makes my ADHD go bonkers too and I always LOVE your photographs. Hope mine are that good some day! Oh my goodness this looks so delicious! It’s such a simple idea and perfect for Summer! Great Blogger’s Choice pick :). I love California rolls! This is such a unique twist! Enjoy the weekend with the in-laws! This is an awesome idea! California roll is one of my favorite types of sushi! 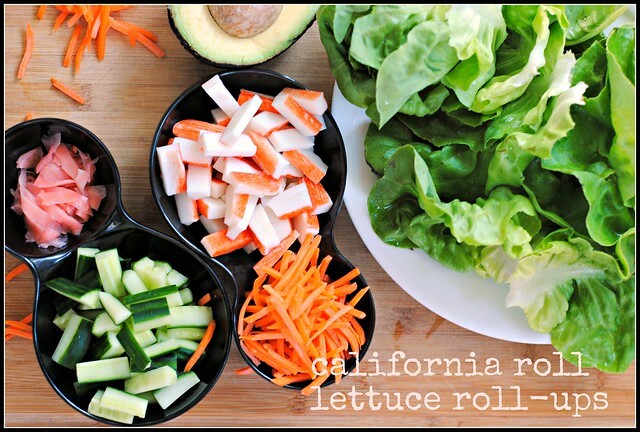 What a great way to enjoy California roll flavors at home! I’m impressed you scheduled a post early – I feel like I’m always behind!